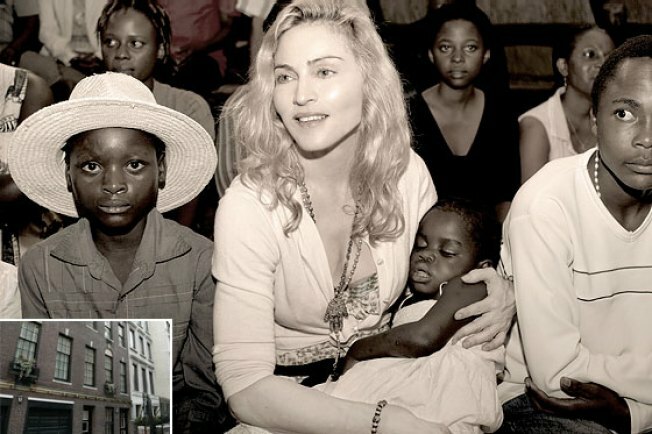 We know we keep running this picture (with Madonna's new UES home inset on the left) over and over, but it's really because we are kind of haunted by the kid sitting to the pop star's left. Kate Moss got into a tiff with her rocker boyfriend, Jamie Hince, throwing his laptop in a swimming pool. Sadly, the computer contained six of his band's latest songs that weren't backed up. But we don’t feel too badly for him because, you know, he's dating Kate Moss. Lindsay Lohan and Ryan Seacrest simultaneously tweeted about their reality-show-in-the-works. Lohan promises it will be "something meaningful like Extreme Home Makeover." Madonna finally joined Mercy in London. Amy Winehouse applied to become a permanent resident of St. Lucia. And Michelle Pfeiffer and Kathy Bates think we should legalize prostitution. And at a United Jewish Appeal lunch, Justin Timberlake said he was just "some schmendrick from a goy band." Supermodel Iman doesn't like her legs. But she does like Angelina Jolie. Meanwhile Brad Pitt's Steven Soderbergh film Moneyball has been put on hold. Oscar-winning Milk screenwriter Dustin Lance Black says that growing up gay in a Mormon household was really tough, and it didn't get any easier when PerezHilton.com posted some scandalous photos of him. Paul McCartney will be an animated squirrel in the big-screen version of his book, High in the Clouds. Actor Rhys Ifans only signed on to Nottingham, the next Robin Hood film, when his ex Sienna Miller dropped out. Producer Quincy Jones is headed for Broadway with The Genesis and Evolution of Jazz and Blues. Shakira lunched at Michael's with some Marie Claire editors, and Peyton Manning dined at '21' with his brother, Cooper. Though designer Yigal Azrouël's relationship with Katie Lee Joel (which included some "dirty dancing" in Miami) supposedly played no role in her split with Billy, Azrouël's known for being quite the ladies' man, sleeping with fashion editors who can help his career and inviting women over for "dinner parties and to play video games." Interesting. Matthew McConaughey and his girlfriend are expecting baby No. 2. SNL's Jason Sudeikis gave relationship advice to NFL wide receiver Chad Ochocinco and his girlfriend in the green room of HBO's Joe Buck Live. Rihanna is (finally) expected to testify against Chris Brown in an L.A. court today. Anna Faris and Chris Pratt tied the knot in Hawaii. Joe Jonas told Larry King about his brother, Nick's, back-on relationship with Miley Cyrus. As if we didn't already know. Art collectors are accusing Louis Vuitton of turning fine art into fashion leftovers, specifically Vuitton's rehashed swatches of designer Takashi Murakami's prints, which now sell for $6,000 a piece. Amber Tamblyn was confused and stressed at the Whitney Art Party, until David Cross (her date, twenty years her senior) showed up. Meanwhile, when a female fan shouted to Bradley Cooper, "Women burn for you, Bradley!" Cooper responded, "Women burn for me? Literally catch on fire? That sounds horrible." And as you can imagine, it's a tough life for Blake Lively. "I get up every morning and put on a giant ball gown, 6-inch heels and cat-fight with my best friend, while simultaneously breaking up with my boyfriend and sometimes killing someone."